Rand had his first emergency room visit of the year today. 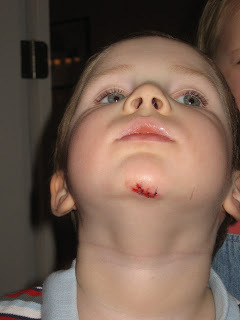 He tripped when running to turn off the TV and cut his chin on our built-in bookshelves. Rhianna was really sad when he got hurt. As soon as she saw that his face was cut she started crying and she immediately said a prayer. I took him into the bathroom to take another look at the cut and see how bad it was. Again, she came and she saw the blood and said: "I already said a prayer, but I am going to say another one." Rand was a trooper, I stayed home with Seth and Rhianna and Stephanie took him to the emergency room. That meant that he had to hold the cloth onto his cut in the car. He did it, even though it hurt. He was also really tough and brave in the ER. 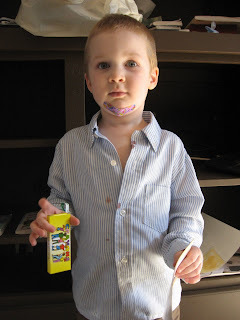 The doctor first put a cream on his face that was supposed to anesthetize him so that they could stitch him up. When the doctor put in the first stitch, he turned his head towards Stephanie and started crying and just said: "Mom, it really hurts." The doctor had to finish up that stitch and was amazed how tough he was. Then, they went and got lidocaine and that shot hurt almost as much as the stitch did. But he was strong and made it through. Because Stephanie had the van, I couldn't take Seth out because I didn't have a car seat for him. Rhianna really wanted to go to church, so we called a family in our ward (Thanks Lydicks!) and they picked her up and took her to church. 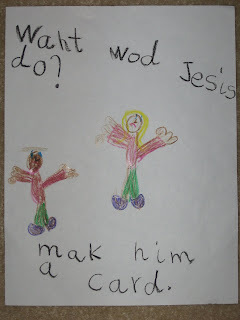 At church in her primary class they were learning to think about what Jesus would do, and they were supposed to draw a picture. Here is the picture Rhianna drew. She drew Rand with a cut on his chin, and her with a big frown, and she thought, that Jesus would draw Rand a card to help him feel better. When Rand and Stephanie got home, he really impressed me. 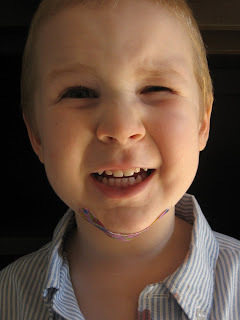 He came in through the door (looking pretty beat up in a bloody shirt and a band-aid on his chin) with a big smile feeling very proud and said, "I'm fixed!" He also thought the bracelet the hospital gave him was cool. It was an interesting experience. It is never fun to see your child in pain, but we were so proud of Rhianna with her tender heart, and Rand with his courage. poor kid... I hope he gets better soon! Progress Report: Rhianna is Engaged! Jesus Wants Rand for a Sunbeam!